Other water scientists ask me how we know whether the water resources in Uganda are adequate to supply all the new water wells we and others are installing. With water shortages in places like California constantly in the news in 2015, this is a question we are addressing with actual measurements of the water levels in wells we’ve installed in Uganda. Thanks to the very generous donation of electronic transducers from two manufacturers we are now collecting water level data every 15 minutes from three wells. A fourth transducer will be installed in the solar-powered well on the FEM Farm by a well service company the next time they are in that region. The company In-Situ, Inc, based in Fort Collins, Colorado, donated two of their Troll 100 transducers and two barologgers to this project. The barologgers record atmospheric pressure, which is used to adjust the transducer data so it reflects only water level changes due to groundwater fluctuations. 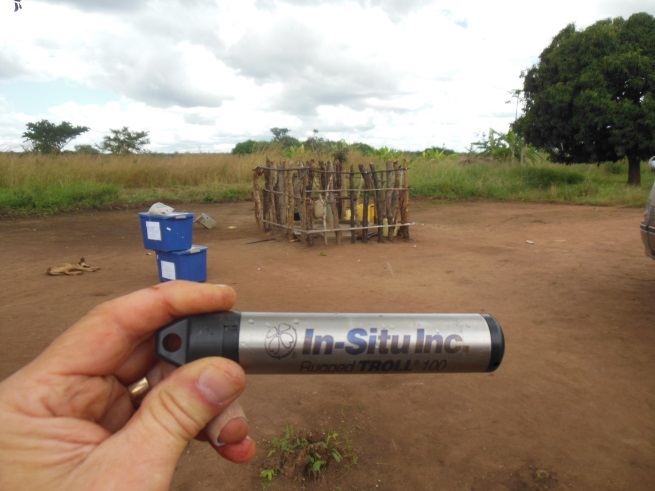 One of the In-Situ transducers was installed in the Moroto West well in northern Uganda (pictured below). This is a very remote area of the country which is still in the process of recovering from the devastation of the LRA war. HydroSolutions thanks In-Situ for this valuable donation.